We can clearly see the black graph, it represents a conic section passing through five points A, B, C, D and E. As we change the positions of the five points (A, B, C, D and E), the shape of this conic section changes and it becomes a circle, a parabola, an ellipse or a hyperbola. Questions to think about What is the relation between a and b when these five points are arranged in such a way that we have a circle? What is the value of h when these five points are arranged in such a way that we have a circle? 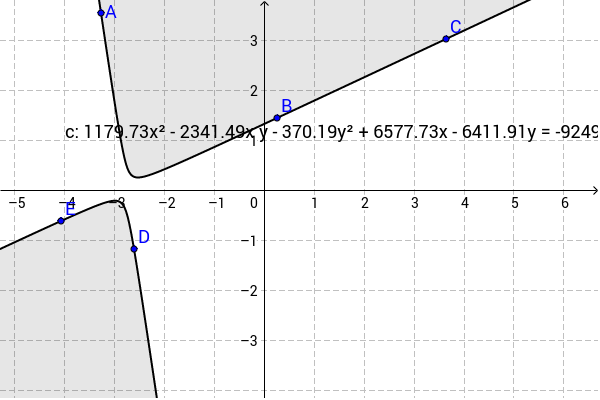 What is the relation between h^2 and ab, when these five points are arranged in such a way that we have a parabola? What is the relation between h^2 and ab, when these five points are arranged in such a way that we have an ellipse? What is the relation between h^2 and ab, when these five points are arranged in such a way that we have a hyperbola? Place these 5 points in such a manner that we get a pair of lines. Calculate the value of abc + 2fgh – af2 – bg2 – ch2, what do we get?